But whatever your situation, you can adjust the amount we withhold from your retirement benefit at any time. Just follow these Step-By-Step instructions. Fill in the top of the form with your name, address, last four digits of your Social Security number and Registration number (if known). Complete Section 1 if you do not wish to have any federal income tax withheld. Complete Section 2 if you want us to withhold based on current Internal Revenue Service (IRS) tax tables, your marital status and the number of federal exemptions you claim. To see how much that would be, use our tax withholding calculator. You can also have an additional amount withheld. Complete Section 3 if you know how much you want withheld. Remember, the amount you should include here is the total amount you want withheld from your pension, not the amount you want to add or subtract from your current withholding. Date and sign the form. 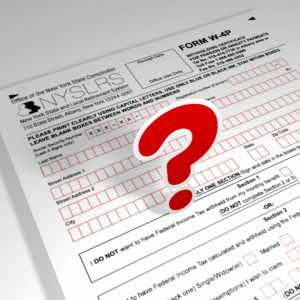 Mail or fax your form to NYSLRS. Our address and fax number are at the top of the W-4P form. Visit our website for other resources, including an interactive Understanding your W-4P Form tutorial, and more information about Taxes and Your Pension. This entry was posted in General News, Retirees and tagged federal income tax, federal tax withholding, federal tax withholding calculator, Information is the Key, New York State & Local Retirement System, NYSLRS, NYSLRS Retirees, PFRS, retirement, tax refund, W-4P, withholding, Withholding Certificate for Pension or Annuity Payments on February 8, 2017 by NYSLRS. Two years in a row we have been short on Fed. withholdings. We adjusted to 8-9% in order to cover. My wife and I are receiving pensions along with other employment. Individually, they fall short for withholdings but added together were got walloped. Hope this helps. We recommend checking with an accountant or tax preparer if you need to adjust your federal withholding but aren’t sure how.